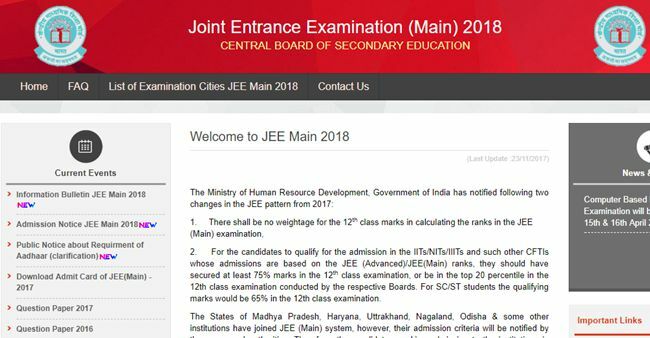 Requirement of Aadhaar for the Applicants of JEE (Main) 2018: In reference to admission notice for JEE(Main) 2018 published in the news papers regarding provision of Aadhaar at the time of filling online application for JEE(Main) 2018, following is being clarified. The use of Aadhaar for the applicants of JEE (Main) 2018 will result in accuracy of the applicants’ details. This will also help in ascertaining identities of the applicants at the examination centres in a convenient and hassle free manner. Aadhaar obviates the need for producing multiple documents to prove one’s identity. The provisions of the Aadhaar Act and Regulations under the Act have come into effect from 14th September 2016 and notifications to this effect have been published in the Official Gazette. Section 57 of the Aadhaar Act 2016 permits the use of Aadhaar number for establishing the identity of an individual for any purpose pursuant to any law or any contract to this effect. Applicants who are in possession of Aadhaar, shall enter Aadhaar number, name, date of birth & gender in online application for JEE(Main) 2018 for the purpose of his/her identity and authentication thereof. Applicants not yet enrolled for Aadhaar, are hereby required to make application for Aadhaar enrolment in case he/she is entitled to obtain Aadhaar as per section 3 of Aadhaar Act. Such applicant may visit any Aadhaar enrolment center (list available at www.uidai.gov.in) to get enrolled for Aadhaar. The above provisions shall be applicable in all states except J&K, Assam & Meghalaya.